Questoverseas: Eton shut for a week, time to plan your gap year! 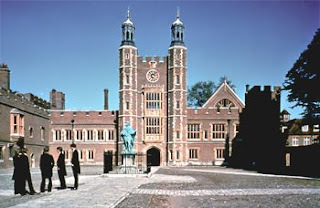 Eton College is the latest place in the UK to suffer from swine flu. After confirming one student tested positive for the virus, they have decided to close the school for a week as a precautionary measure. As this is one of the finest schools in the country, we are sure that the boys won't be taking this week off to party all night and lie in til late, rather it is the perfect time to revise for exams, or maybe plan for your GAP YEAR! To help you with this, here are a few tips to get started. Quest Overseas is of course one option for your gap year, but to find out about some of the other established organisations out there, take a look at the Year Out Group website, where you will find links to all different kinds of structured placements. If you are thinking of volunteering, the Ethical Volunteering website gives you an excellent set of questions to ask any volunteer placement organisation, to make sure the work you will be doing is truly worthwhile. All being well though, the school should be open in time for the Eton College Gap Fair, on Saturday 20th June, from 10.30am to 12pm. We will be there, as will a number of other organisations. Make sure you stop by to learn about the wealth of options available to you!